Note: This tutorial assumes that you have completed the previous tutorials: Installing and Configuring Your ROS Environment. Description: This tutorial introduces ROS filesystem concepts, and covers using the roscd, rosls, and rospack commandline tools. Packages: Packages are the lowest level of ROS software organization. They can contain anything: libraries, tools, executables, etc. Manifest: A manifest is a description of a package. Its most important role is to define dependencies between packages. Stacks: Stacks are collections of packages that form a higher-level library. 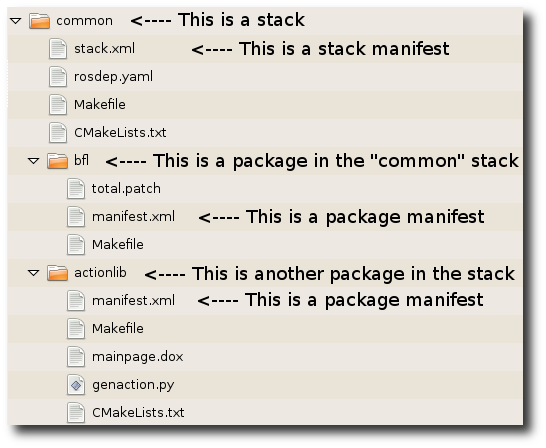 Stack Manifest: These are just like normal manifests, but for stacks. A package is a directory with a manifest.xml file. A stack is a directory with a stack.xml file. Code is spread across many ROS packages and stacks. Navigating with command-line tools such as ls and cd can be very tedious which is why ROS provides tools to help you. rospack and rosstack allow you to get information about packages and stacks. In this tutorial, we are only going to cover the find option, which returns the path to package or stack. You can see that YOUR_INSTALL_PATH/share/roscpp is the same path that rospack find gave in the previous example. There are a few special places you can tell roscd to go, that are not a package or stack. Note: Prior to Fuerte, roscd would take you to $ROS_ROOT. rosls is part of the rosbash suite. It allows you to ls directly in a package, stack, or common location by name rather than by package path. After pushing the TAB key, the command line should fill out the rest. This works because roscpp_tutorials is currently the only ROS package that starts with roscpp_tut. Note: rosbuild users might be wondering where stacks went. The concept of stacks was removed with catkin to simplify the growing code base and to support better distribution of packages. In catkin you can define metapackages to collect similar packages and multiple packages can reside in a single VCS repository. Those two features replace the functionality of stacks. Similarly to other environment paths, you can add additional directories to your ROS_PACKAGE_PATH, with each path separated by a colon ':'. rosls is part of the rosbash suite. It allows you to ls directly in a package by name rather than by absolute path. Now that you can get around in ROS, let's create a package.